Review: Luane Johnson created a startling book for young adults when she wrote MUCHACHO. Eddie Corazon is a Mexican teenager trying to find his place in New Mexico. Although given the gift of intelligence, he, like so many others, throws is aside in order to "fit in" in a society that is riddled with underachievement, substance abuse, crime and violence. 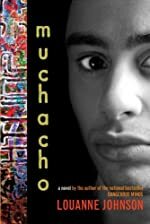 MUCHACHO gets at the heart of adolescence as the reader follows Eddie's thoughts and movements at an alternative school for behaviorally challenged students. Eddie is a troubled teen who is more concerned about the next fight instead of the future he could be able to create - that is until he meets Lupe. Lupe, a young woman who has transferred from another school in order to get away from bullying, is smart and beautiful - and she quickly sees that Eddie is much more than what he seems to be on the outside. She and Eddie begin dating and gradually Eddie starts to see himself in a very different light. He no longer is the hopeless teen that is just figuring out how to prolong the inevitable jail time, but rather a worthwhile contribution to society. But, Eddie's path to success isn't an easy one, and certainly there are bullies and troubled family members to make life difficult along the way. But, with Lupe's confidence and Eddie's mother's wish for him to be the first Corazon to go to college, Eddie slowly begins to appreciate life and more importantly he begins to appreciate himself. MUCHACHO takes a hard look at the callousness of life and shows that hope lies just below the surface. Johnson used an intriguing style of writing in MUCHACHO, as the reader is quickly implanted into Eddie's brain. It is written from Eddie's point of view and uses the typical language of a troubled teen. With this in mind, MUCHACHO should be reserved for high school students. Aside from the language, there are also mature themes throughout the novel. This being said, it is a fantastic book for the right audience. Throughout the novel there are hidden messages that the author subtly gets across to the readers. For example, Eddie criticizes the way teachers typically correct pronunciation of a word when a child is reading out loud. In an effort to explain why his teacher, Mrs. Beecher, is better than others, Eddie says, "The other teachers would jump on that wrong word and pronounce it the right way the second you said it wrong because even though they went to college and we didn't, they always have to show how smart they are. But, Beecher was too busy trying to show us how smart we were instead of how smart she was, so by the time we wised up to how smart she was, she was already gone." What a wonderful message! Also, the prose is so enlightening to a life not everyone understands. Take for example being a Mexican trying to be accepted in America. Eddie demonstrates how frustrating that can be when he says, "In Spanish, you say the letters in all the words just like they look. 'A' is always 'ah', and 'E' is always 'ay', and 'I' is always 'eee'. We don't have six different ways to say the same letters, like dough and thought an through and tough which all have 'o-u' but different pronunciations, so that when you're trying to learn English you look stupid no matter how smart you are." Johnson opens the readers to a world many of us have never experienced and makes it so real you hate for the last page to arrive. Eddie's character develops so thoroughly throughout the 197 pages. He goes from a misguided, lost soul to someone with a purpose and goal in life. MUCHACHO is a gem - and one that would be recommended for not only teens, but also for adults - particularly in education. Because for educators, the messages in the novel are priceless. We would like to thank Random House for providing a copy of MUCHACHO: A Novel for this review. Have you read MUCHACHO: A Novel? How would you rate it?